Butterfly and evenly pound chicken breast. Season with salt and pepper. Layer speck, provolone and sage on chicken. Tightly roll the chicken, then wrap with plastic wrap until ready to cook. Heat margarine in oven-safe pan until melted. Unwrap chicken, lightly flour, then sauté until golden brown. Finish in oven, baking approx. eight minutes until cooked through. Serve with sauce and sides of choice. 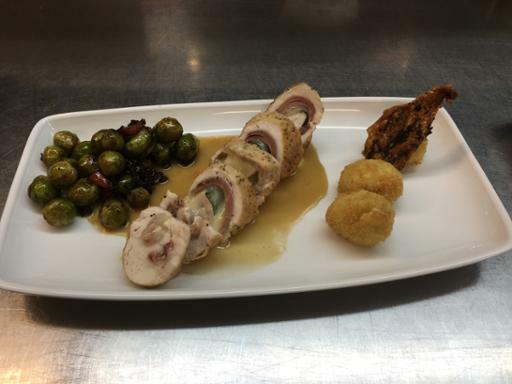 Originally served with a white wine veloute, Brussels sprouts and oblique cut carrots, potato croquets, and a crispy chicken skin garnish.